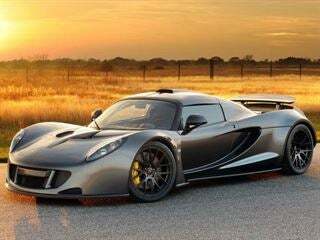 Hennessey Venom GT, the new king of speed. 270mph record. If you haven't heard yet, top gear took the venom gt to an 3.22 mile runway at the kennedy space center and got the venom upto 270.49 mph, beating the Veyrons SS's previous record of 269.856 mph. It is not official because Guinness requires that at least thirty car be produced, and Hennessey is only making 29 with 11 currently delivered. The run is also not official because there was no second run in tho opposite direction. (to account for the wind, and get an average speed) Nasa only allowed one run, and the process to even get a run booked on the runway was a 2 year process apparently.